Disclaimer: I am in NO way a nutritionist or dietician. I’m simply here trying to tell my own personal story. I’d be happy to discuss what helps me maintain my lifestyle with you in a personal message, but aside from that – I highly recommend that you do your own research or consult a nutritionist on what lifestyle change would work best for your body! So, growing up, I was thankful to have a lot of friends. Those friends loved me and accepted me for who I was. However as I grew older, I began to notice there was something off. Why were my friends able to eat 3 pieces of pizza and not gain a pound? Why could they drink all the soda they wanted? Meanwhile, I was over here, 150 pounds by the time I was in 6th grade. My mom blamed it on their “high metabolisms”. I just always remember feeling so ashamed and ugly. I was just always the “bigger” friend. And I continually carried that role me with as I grew older. I was a sophomore in college in the left photo above. When I went to college in my hometown, I was able to live at home instead of the dorm to save money. I think that was a huge wrong step for me. I loved still living at home because 1) my own bathroom and 2) no roommates. But it really sheltered me from fully experiencing college. I basically just went to class and came home. I never joined any clubs, no groups of people, nothing. I just made the one obligatory friend that you sat beside in each class. And that was that. I was lonely. Miserable in my own body that had become my enemy. So, by the time New Years 2014 rolled around, my reasonings behind wanting to lose weight weren’t completely selfless to say the least. I was tired of being overweight and feeling so hollow in my own body. I didn’t want to lose weight to become healthier. I wanted to lose weight to become SKINNY. I wanted to lose weight because in my mind, that is what was going to get me FRIENDS. And a BOYFRIEND. And a LIFE. Seriously. I equated being skinny to getting everything that I wanted. Equating your weight with your worth is one of the most dangerous things you can do as an individual. And that’s what I did. That was the sole motivation behind my original weight loss goal. That was what drove the hard times, the constant exercise, the counting every single calorie that I put in my mouth. And what do you know? 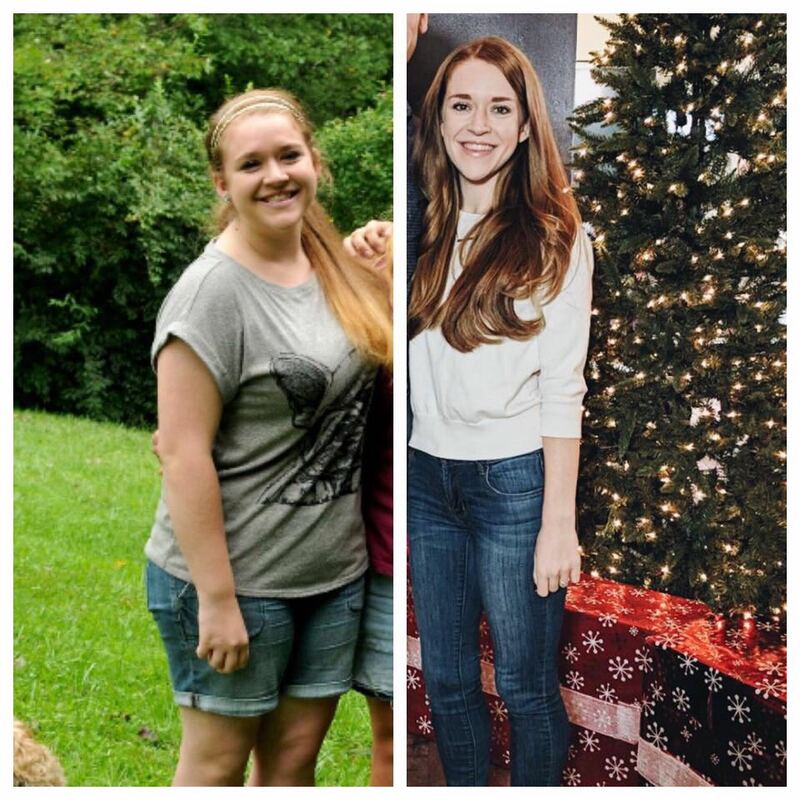 When I lost the weight, I started dating! I made new friends! I was finally getting those “good morning beautiful” texts that I had been hoping for. Unfortunately, in getting what I wanted, I lost myself. I turned against my body. No “goal weight” was ever going to be enough. Take for instance the photo below. Scary skinny Haylie. In this photo, I had far surpassed my goal weight. I had a boyfriend (who is now my husband! <3)…yet I still deprived myself of foods. I still over-exercised. I still made wrong decisions. Who knows how different things would’ve been if I had just put myself out there before I began losing the weight? Maybe I would’ve dated then. Maybe I would’ve made more friends. However, I was where I was. I continued to let the lie that being thin would get me dates, make people attracted to me, get me friends and just over all allow me to have better opportunities in my life. What I didn’t realize was the fact that I already WAS beautiful. My entire family had always loved and supported me. I had a few really good friends who loved me no matter what my size was. And the most important person who loved me, Jesus. He made me perfectly. However, I went a year and a half in my weight loss journey before I realized this truth. It didn’t happen over night. When you go through such a unique transformation as I did, literally shedding so much of your body weight, it messes with you. In fact, four years later, I still have demons that pop up in my head. Daily. Something in me cringes when I take a bite of a cookie. It screams at me “Don’t eat me! You’ll get fat!” But do I allow those harmful thoughts to determine my actions? Not anymore! I can eat a cookie if I want to. It’s that simple. How it works for me is thinking about moderation. Indulgence in moderation. This one delightfully warm, soft and buttery cookie is NOT going to make me gain fifty pounds. Knowing and resting in that truth is one of the main reasons that I found freedom in food. I no longer count every single calorie. I no longer exercise twice a day. I’m able to enjoy a glass of red wine and a slice of pizza and have no guilt. The photo below is of me NOW. Fulfilled in knowing that I am worth way more than the scale tells me. Btw, in this photo i’m drinking a WHOLE MILK latte. YAS to finding food freedom! Rest in the truth that you are beautiful. You have worth. Your weight doesn’t define you. P.S. 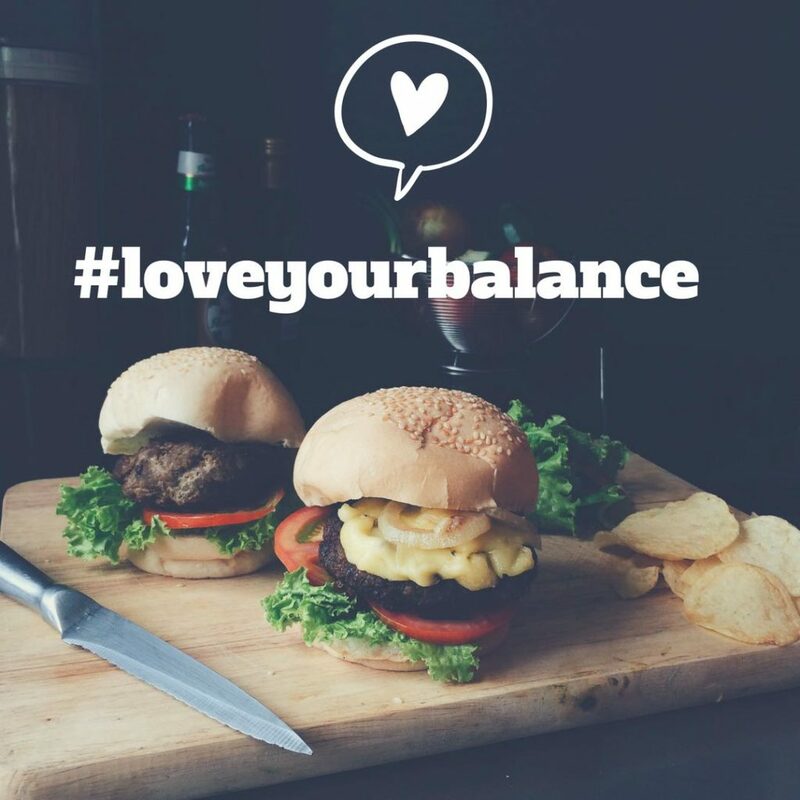 Make sure and use the hashtag #loveyourbalance to let me know how you’re embracing your own balanced (or un-balanced) lifestyle! Can’t wait to see all of your posts! I hope every woman reads this and understands about balance … understands the difference between their personal value and their weight. Thanks for sharing this Haylie. Food fears are so damaging! It’s awful that something God intended as good and a blessing can be twisted into something that controls us! Eating disorders take on many forms and so I think people realize there’s a problem but don’t know how to address it and don’t realize that other people deal with the same issues. I think it’s hard when it doesn’t have a name. When we talk about it the fear of food can lose it’s power so I really appreciate you doing this. I remember sitting in a Costco parking lot, crying because I didn’t know what to feed my children, the fear was paralyzing. I still can tell you everything that’s wrong with every food in every grocery store but the thing that’s different is that God has taken away the fear, He totally gave me ‘food freedom’! The balance is real, it’s tricky sometimes, we eat better some seasons than others but I am not trapped in the food struggle. Food does not define me any more! I am so thankful for this work God has done! I’ve been really inspired by your recipes. I love how you allow a little bit of junk food into your life – like the ‘one delightfully warm, soft and buttery cookie’, the point it that it’s one, not ten! Great work, I like what you’re doing, keep it up! Thanks so much for your kind words, Kim! Food freedom is amazing and even though there are times when it is still a struggle, I’m thankful God has brought me out of it! You’re truly an inspiration! I’ve never been able to have the strength to actually lose a bunch of weight and “get skinny”… I always quit early because, well, carbs. But I’ve thankful been able to find balance and eat more whole, healthy foods balanced with foods that are terrible for you. I do the same in most areas. For instance, I used to basically NEVER use skincare of any kind and when I did it was like, Neutrogena. I thought I was making a good decision but I wasn’t. A few years ago I started using Beautycounter, an all naturally based, toxin-free (super expensive) skincare line. The ingredients are real and tested to not cause cancer, birth defects, infertility or allergies. And they work!! What more could you want?! BUT…. sometimes I want to try something less expensive at Target or even at Sephora. Sometimes I feel bad when I pick up a product that isn’t “all natural” and “toxin free”… but I have found a balance in looking for skincare (and makeup) that is atleast free of parabens and has more whole, pronounceable, quality ingredients!! I don’t have to buy the MOST expensive, high quality, safe skincare and makeup everrrrrrytime. I can make other choices that I feel good about and for me that loving my balance!!! P.S. I do the same thing with hair care! I LOVE ORIBE (the highest end line in my salon) but I do sometimes try or use things I find at one of my salon stores that’s less than half the cost! I can still LOVE and use Oribe and love something else a little cheaper too. Balance!! !